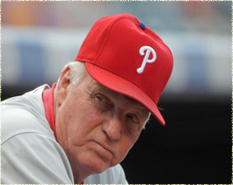 Charlie Manuel made it clear Saturday that he has no desire right now to discuss a new contract. "I'm very satisfied with the way it is," Manuel said outside the clubhouse at Bright House Field. "This is my ninth year and I know the good things that we've had and I never should have to sit and tell somebody what we've done." The 69-year-old skipper is content. He holds the franchise record for wins and has led the Phillies to five postseason appearances. He knows his future in Philadelphia hinges on the next eight months. "If we lose 10 games or win 10 games, I don't want nobody to ask me about the contract," Manuel said. "It's not going to bother me. I've seen Joe Torre, his contract's have run out before, like Dusty Baker and Tony LaRussa. It's the way it goes and I'm not worried at all. "I shouldn't have to explain it to anybody - the team, or President Obama, or anybody. Seriously. That's kind of how I look at it. I'm not worried about my contract. I've been in baseball 51 years and right now I definitely plan on staying in baseball and I plan on managing." Before addressing his contract, Manuel continued his yearly tradition of speaking with the entire team prior to the first full-squad workout. Manuel said the speech was not sentimental, but instead a reminder that the season is long and focus is crucial to success. "We have a whole lot of talent here," Manuel said. "We still have a good team with our veteran players. Of course, everyone will say they have to stay healthy and they have age on them. We'll see." Chase Utley and Ryan Howard both appear healthy after missing sizable portions of last season, plus the club added depth to the bullpen signing Mike Adams while also trading for speedy center fielder Ben Revere. "Our goal is to go out and win the division and the World Series," Manuel said. "Nothing is different this year than any other season." As for his contract, Manuel knows there will be a time to sit down and discuss his future but now the focus belongs elsewhere. "At the end of the year, somewhere along the line, David Montgomery and Ruben [Amaro] and I will more than likely have a talk and that's kind of how I see it," Manuel said.